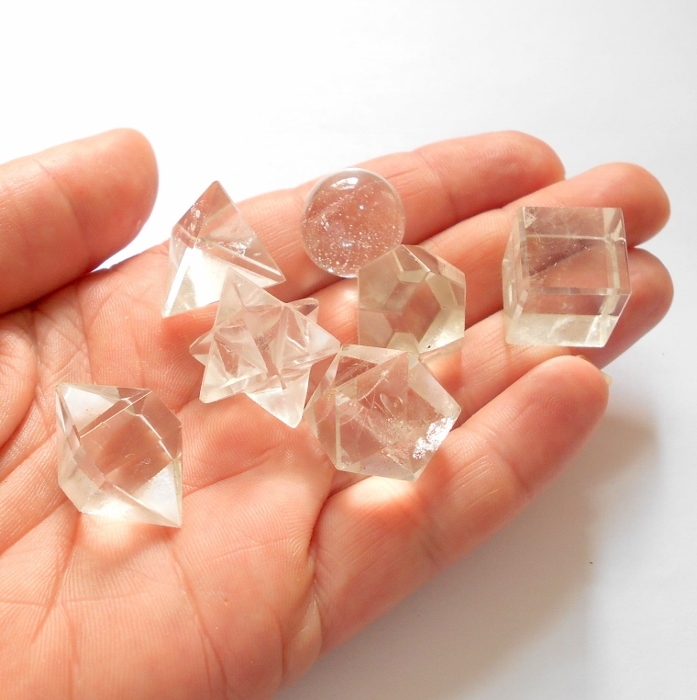 Clear quartz set of seven sacred geometry shapes including the platonic solids, a sphere, and a merkaba star. The Platonic Solids are named after Plato and were studied extensively by the ancient Greeks, although he was not the first to discover them. Plato associated the cube, octahedron, icosahedron, tetrahedron and dodecahedron with the elements, earth, wind, water, fire, and the cosmos, respectively. 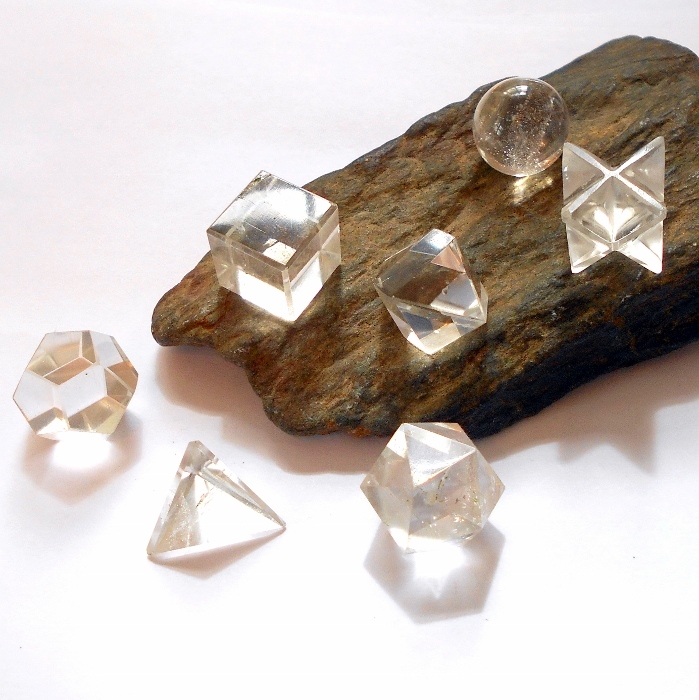 Crystal Platonic Solids can be used for meditation, healing, chakra work, grid work, and manifestation. In grid work, they can be used together, or separately, each as a center piece in its own crystal grid. The tetrahedron has 4 triangular sides and symbolizes the element of fire. It is linked to the Solar Plexus chakra, the center for personal power and acceptance. The power of fire and the power present in the tetrahedron are beneficial for creating change. The hexahedron has 6 square sides and represents the element of earth. Hexahedron is linked to the Root Chakra. Meditating with this shape assists in grounding energy, maintaining focus, removing tension and easing physical stress. It is a symbol of a solid foundation and stability, patience and consistency. The Octahedron has 8 triangular sides and symbolizes the element of air. It is linked to the Heart Chakra, the center for love and compassion. Working with the Octahedron attunes us to the more spiritual nature our self and helps us understand our true nature, compassion, and healing. The Dodecahedron has 12 pentagonal sides and is a symbol for the universe. The Dodecahedron is linked to the higher Brow and Crown Chakras. The Dodecahedroncan raise your vibration up to facilitate connection to your higher self, allowing us to go beyond our physical body and connect with our true nature. The Icosahedron has 20 triangular sides and symbol for the element of water. It corresponds to the Sacral Chakra. Water is all about movement, flow, and change. The Icosahedron assists in enhancing creativity, removing emotional blockages, and stimulates freedom of expression and positive change. The Merkaba is a combination of two star tetrahedrons, one pointing up to the heavens, channeling energy down from the universe, and one pointing downwards, drawing energy up from the earth beneath us. The Merkaba is a divination tool used to connect with and reach those in tune with the higher realms. "Mer" means Light. "Ka" means Spirit. "Ba" means Body. Mer-Ka-Ba means the spirit and body surrounded by counter-rotating fields of light and spirals of energy which transport the spirit from one dimension to another. The Sphere is a figure that is complete in its entirety. All measurements are equal in a sphere. While the sphere is the simplest form in sacred geometry, it is also the container that can hold all of the other forms. The earth, a seed, and an atom are all spheres. The Sphere emits equal energy in all directions and is used as a window to the past or future. Stones are approximately 3/4 inch each and there is a little size variation in each set. Price is for one full set of seven stones.